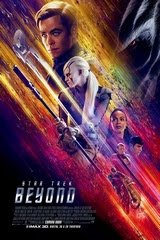 It is starting to seem as if I like sci-fi, while in fact I am just curious to see what they would make of a contemporary Star Trek film. Like with the last Star Wars this Star Trek is “based on characters created by…”. It has little to do with what I remember of Star Trek. We have Captain Kirk and Mr. Spock, but are they supposed to be children of the original characters? In a too rapid ‘intro’ we learn about the spaceship Enterprice and the world the crew lives in. The ship is sent on a rescue mission and they end up fighting a dark enemy in an unknown area of “the nebula”. The film has humor that does not really work (in the beginning almost on ‘screwball’ level), drama that does not really work and mostly seems to want to impress as a space spectacle with star wars, but… it does not really work. What remains is a weak film with a few elements that you may know from the old films.